Shiya Goshima is no ordinary Japanese restauranteur. While many a Japanese master serves you their creation, stoically steps back and allows their craft to speak for itself, Goshi-san (as he’s more affectionately known) is passionate, animated and talks about sake with a twinkle in his eye. His former restaurant, also named Godenya, used to be one of Tokyo’s best-kept secrets. Located in the northeastern suburb of Sumida, you could easily walk past the six-seat eatery without batting an eye at the low-key exterior. Regardless, patrons from all over Japan made the trek to the nondescript diner to sample its sensational sake and food pairings. Despite the acclaim, Goshi-san’s amibition is bigger than Japan. In September last year he closed Godenya, and later decamped to Hong Kong, reopening the restaurant on Kau U Fong. You’d think it impossible to replicate the covert location the original enjoyed in Tokyo, but Goshi-san eventually found just the spot. Though the official address places it on Wellington Street, the entrance is actually down a grungy alley. Even once you’re in the alley it’s not an obvious spot – a rusted sliding door set inside bare concrete walls turns out to be the unmarked entrance. We enter the six-seat establishment and Goshi-san has already printed the night’s menu for us. 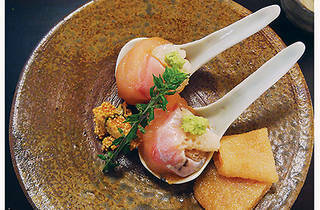 There is only a single set menu ($1,000) available with a fixed sake pairing that’s within a $500 band. Each course is labeled with the accompanying sake’s name, grade and the temperature it’s served at. You heard right. As if on cue, Goshi-san begins tasting and measuring the temperature of the rice wine with a thermometer. Did we mention Godenya is all about sake? Don’t come here expecting any soft beverage other than water, and don’t even think about trying the meal without the alcohol pairing – you might as well listen to your favourite album with the volume off. The first of the evening’s many highlights is tofu with lychee in a cold shrimp soup, matched with a Kid 2015 at 10 degrees Celsius. The flavours of the shrimp soup hit us first, with the tofu acting as a conduit to the lychee. When you take a sip of the sake, the floral notes bring a jasmine finish. If you chase this with another bite you can keep the aromas cycling on the palate. It’s a strong start and we prepare ourselves for an amazing night ahead. Next up is the ayu (sweetfish) with condiments and five spices coupled with Hiwata 2015 at 15 degrees Celsius. This course is not for the faint hearted, as the dinky fish is pungent and sits on a bed of river moss that’s garnished with lily bulbs. The result is what we can only describe as salted liquorice. Just when you’re wondering why anyone would put this on a plate, a swig of sake answers the question. With a spicy front-end when the Hiwata is combined with the alkali notes of the fish, these two opposing flavours neutralise each other – leaving a dry patch of earthiness on the tongue. This course packs quite a punch, as if to emphasise the point that Godenya is about the sake pairing. Served next is a steamed chicken with century egg sauce teamed up with 47 degree hot Tenyurin 2003. The Chinese egg sauce takes up most of the small bowl, but this is fine since the chicken is merely the vehicle for the sauce to reach the sake. Its effect on the Tenyurin is nothing short of magic. The wine dissipates all the soapiness of the egg, leaving a silky smooth yolk flavour sliding down our throat. Interestingly enough, up next, the isaki sushi contains no rice – it’s replaced by winter melon mash wrapped in stinkhorn. Goshi-san explains this is so the grain doesn’t interfere with the 2014 Sougen sake. Though we can’t gauge how much of a distraction the carb can be, the end-product is refreshing and pairs perfectly with the fish. Our favourite dish of the evening, though, is the drunken crab. Matched with Shinkame 2010 at 52 degrees, Goshi-san tells us this is a very special course as the crab is immersed in sake for three days before serving. The cured crab is smooth and teeming with the sweet fragrance of alcohol and the Shinkame it’s paired with is phenomenal. Sweet on the front end, the aromas taper off into a fruity flavour of dried longan. When we asked Goshi-san why he would close up shop in Tokyo to come to Hong Kong, he tells us it’s his dream to showcase to the world what sake has to offer and Hong Kong is his first stop. Judging by what we sampled on our visit, he’s certainly got what it takes to elevate appreciation of rice wine to a whole new level. At time of writing, Godenya is still in its soft opening phase – we’re informed this could last up to six months – and reservations can only be made online during this period by entering a secret PIN that’s released to a selection of friends and loyal customers. So you’d better shake down some Japanese foodie friends to help you or remain patient until it’s good and ready to officially open. 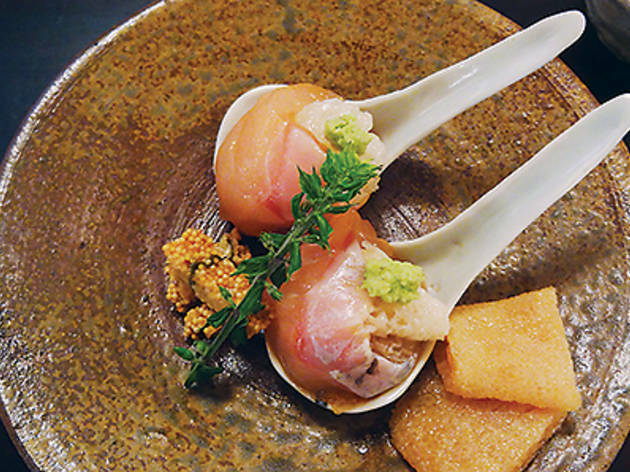 Either way, you’re in for an evening where delectable food takes a backseat to demonstrate the incredible versatility of sake, and that’s what Goshi-san is all about.